Allow me to introduce you to the Namahage. Three hundred and sixty-four days a year, these knife-wielding demons with a penchant for straw coats wander the wilderness on the peninsula of Oga in Japan. But every New Year's Eve, they leave their mountain lairs and go looking for a little human company. 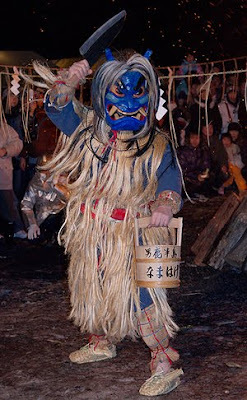 The Namahage visit nearby villages, bursting into homes in search of lazy children. The head of each household must then negotiate with the demons (the negotiations apparently involve lots of sake) and attempt to convince them that the children of the house have been both hard-working and obedient. If the Namahage remain unconvinced, the little boys and girls are dragged back to the mountains and forced to lead a life of drudgery. Okay, now to my main point. The twenty-first century is a good time to be young. 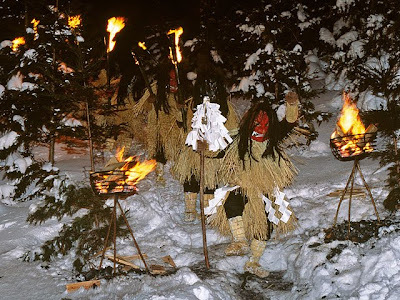 A kid today might squeal a bit at the sight of a Namahage or Krampus, but few would ever take them seriously. But go back a hundred years or so, and I'd bet that these demons were pretty good at scaring the snot out of children. Imagine it. It's 1909. You're a kid in Oga, and your parents warn you that there are terrifying creatures called Namahage living deep in the woods. (And you can't go online to see if it's true.) Then on New Year's Eve, a hideous demon bursts through your door . . .
lol this reminds me of how i used to be so scared of getting coal for christmas, but being kidnapped by a demon is way scarier!!! Kristen: are you feeling better??? Yeah I can see how that would really scare someone. I used be really scared that a witch lurked outside my window. I would deffinatly be scared of them. I scream at the sight of a spider! On the other hand, without computers, they wouldn't be as lazy. Kirsten: I hope you are feeling much better! Man, those Namahage are weird looking! I probably wouldn't be totally terrified, but if I met someone like that in a dark alley . . .
Geez, they are freaky. In Poland there is BABA JAGA- this old witch-y lady to scare littlekins. In the little village where my mom grew up, there is an old wooden cottage right by the edge of a forest. There is furniture and stuff inside, but my little cousins get really scared of the place. just shows to what ends determined parents will go to to harass their children. How come all of them are coutionary tales for children? Wow, that would scare me so much if one of those burst into my house! Although, I probably could knock 'em out with an umbrella or something. The 30th was my mom's birthday, and the death of a dear family friend with some paralysis disease. Some birthday present, huh? But my sister and I found her an orchid for her birthday, which she hopes to keep alive, and went to a local restaurant and had dinner. well, your comments section isn't the place to rant, yet I always do. Litomboyblue11;)--"Letters from a thirteen year old Amazon" sounds interesting! Although, what happens when your older than thirteen and still running the blog? OH MY GOSH THAT IS FREAKY!!! It would STINK to be sick on Christmas!!! Irregular girl: Gnat wrote that, not me. parents have such odd parenting techniques... i mean really! Personally, I think people should be more careful with the monsters they invent. I wonder if you could rent one of those guys, that would be AWSOME!!!!! !